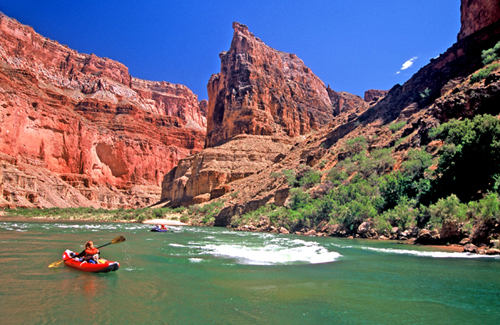 Grand Canyon USA by Canyon Lovers – We Love Canyons! 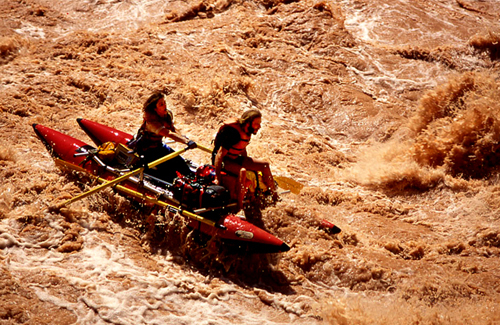 Rafting the Grand Canyon of the Colorado River under your own power is a dream of a lifetime and long sought after technical challenge as well as spiritual goal. Hiking the side canyons like the Little Colorado River, Clear Creek, Deer Creek, Havasupai Canyon with almost uncounted other little known canyons, is a destination adventure in and of itself. After a life time of canyoneering world wide it is hard think of another canyon on earth with as much diversity, beauty or such ecstatic pure natural and creative pleasures. After viewing this web chapter of: www.canyonlovers.com can you agree? Little Colorado River with it’s travertine blue waters at the with the Colorado River and the junction of Marble Canyon and the Grand Canyon itself. One of the top 10 canyon places on earth. 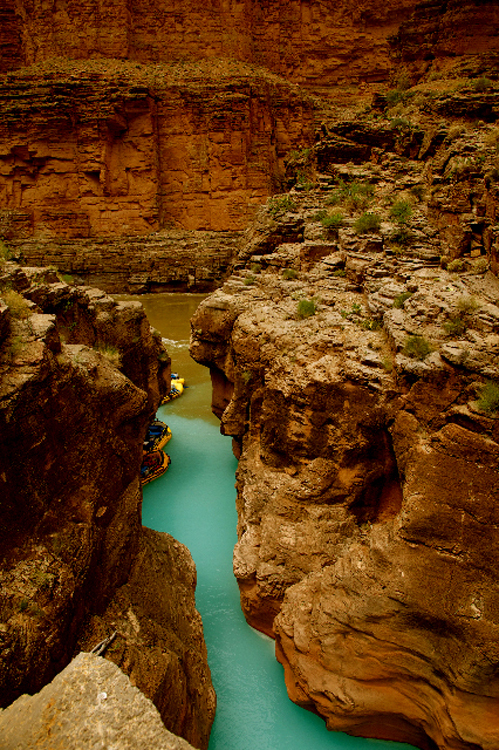 The dream begins as our little raft passes beneath the Navajo Bridge which crosses the Marble Canyon of the Colorado River near Lee’s Ferry in Arizona, USA. It is the only roadway crossing of the river and the Grand Canyon for nearly 600 miles The bridge carries travelers to and from Utah and Arizona , also a key access point which includes the North Rim of Grand Canyon National Park. Before the first Navajo Bridge was built, the only river crossing from Arizona to Utah was at nearby Lee’s Ferry, where the rafting trips are launched in modern times. Travertine sky blue water swimmer. The Little Colorado River is the main river draining the Painted Desert, eastern Arizona and even parts of New Mexico. 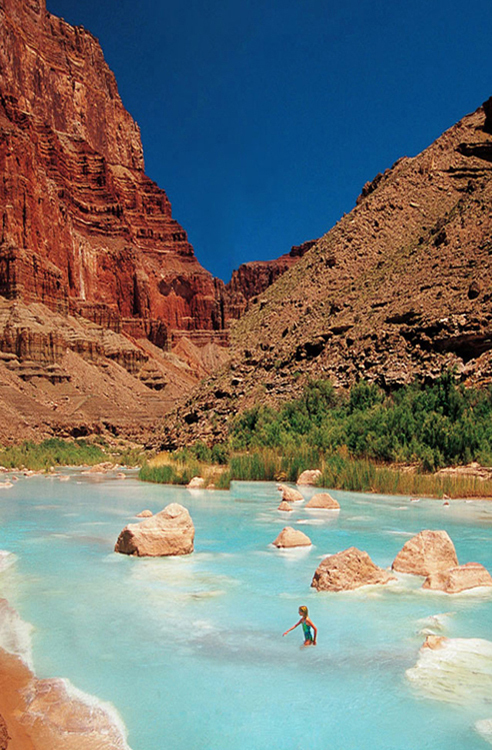 The sky blue waters are made by a very high content of calcium carbonate which comes from the Kaibab and Redwall Limestones of the Colorado Plateau. 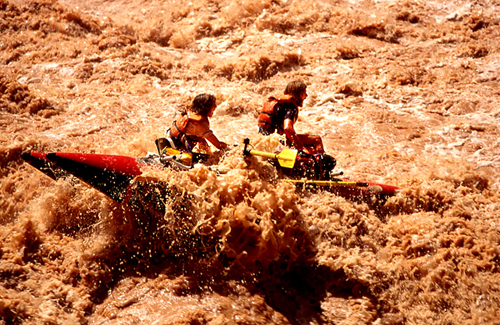 It is a mystical experience when raft trips pull in at the confluence of the Colorado and Little Colorado Rivers. It was an experience that can hardly be surpassed in a life time, especially that of a life long professional canyon photographer. My daughter Mariah had an epiphany in these magical moments of existence. Everyone in our rafting party was watching our etherial little fairy so she was feeling very shy as I gave her hand signals of where to walk in the river. She showed her temper a bit as she exclaimed that she could not understand me over such a long distances. There was so much pressure on me as the location was mobbed by so many tourist from the big “baloney” boats. And our group was taking so much delight in uncomfortable our situation. They were pressuring us to move on to so they could do some hiking further down river. This was our one moment, the very special moment that I had stayed on Grand Canyon rafting waiting list for over 10 years for. And it was perfect, the light, the water color and my perfect daughter…a perfect beauty…in perfect nature. I waved Mariah over and she looked up at me with tears in her clear blue-gray eyes. I put my arm around her shoulders and drew her close to me. I whispered to her, do you remember how we used to do hand signals? We haven’t done it for so long time. Can you remember now? Yes, she whispered, I can do it. 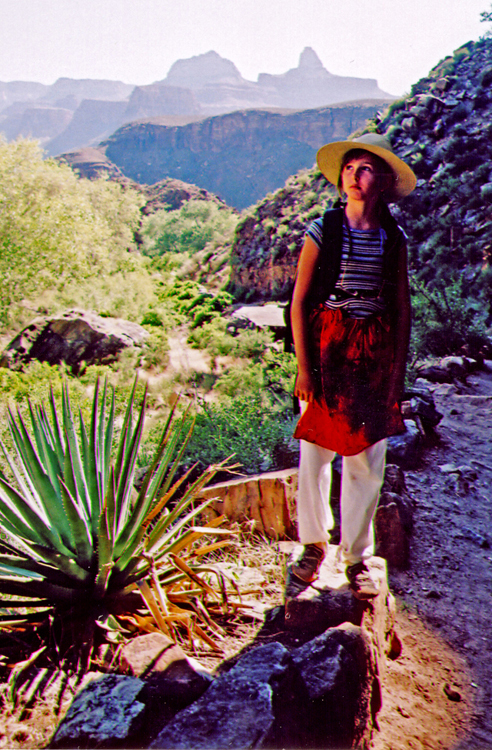 And then….she and I made one of the most beautiful canyon photographs ever. Marble Canyon is one of the safest sections of the Grand Canyon run so here Mariah got her first chance to caption her own boat on any river. 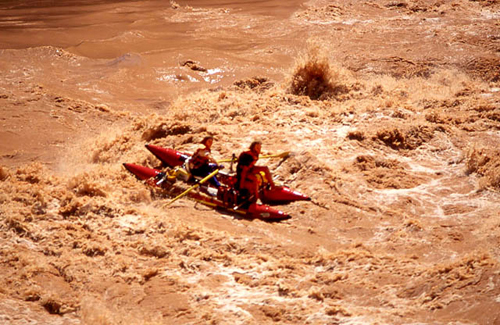 The inflatable kayak was paddled by an adult of lashed aboard one of the larger rafts in the few big rapids on the upper section of the Grand Canyon like House Rock and Hanse. in our Paradise Grand Canyon USA. 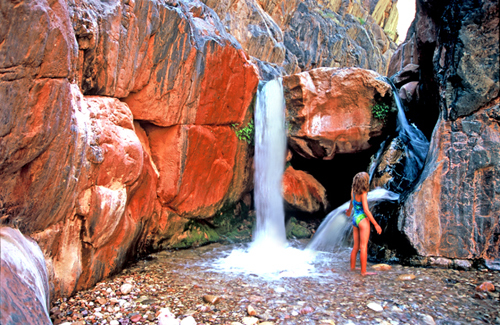 Clear Creek has one of the most fascinating water falls in the Grand Canyon. The Bright Angle Trail originates on the south rim and is the access point at which those on a half canyon raft trip exit the canyon. 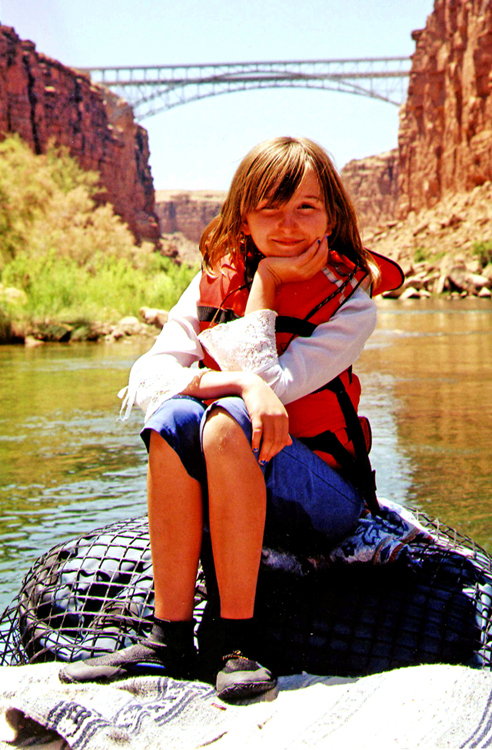 Due to safety considerations and Mariah’s age of 12 years we opted to hike out rather than raft the more rugged and dangerous lower section of the river trip. We hiked up the first section of the Bright Angle trail to the Tonto Plateau in the pre dawn darkness. At Indian Gardens the first sun hit us with it’s early June force. We were so glad to have started in the dark. At the campground we ate a hardy breakfast and wet our shirts. With high spirits we started out in beautiful early morning but soon the sun became harsh and the climb grueling. We hit the “wall” several miles and about two hours below the rim. We stuffed ourselves with high calorie food to no avail. Our bodies could just not absorb the calories fast enough to provide the energy necessary to “top out” comfortably. But with no choice we pushed on knowing that it would just get hotter as the day wore on. We made it over the rim about 2 pm and were so proud. This twelve year old had truly “done” our Grand Canyon. 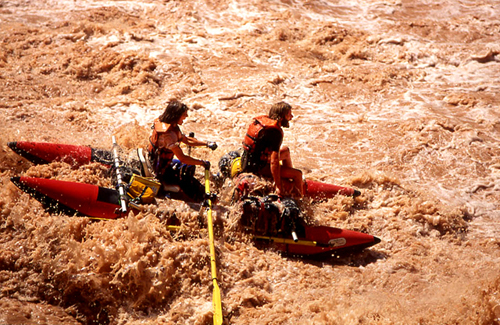 In previous years I had led 3 trips down the “Grand” Below Phantom Ranch begins most of the really big and the Colorado rivers most challenging rapids. Hermit is one of the very best…if you hit the biggest wave head on. 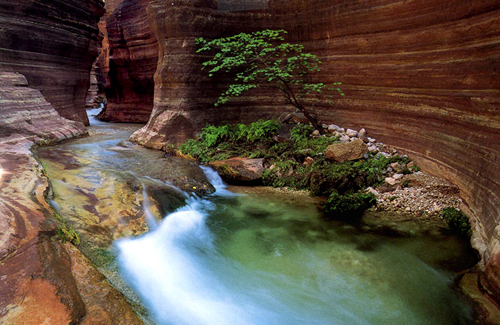 Deer Creek is a stream that flows into the Colorado River from the north through a spectacular slot canyon in the Tapeats sandstone. I had really wanted to hike this incredibly narrow slot down to the head of the Deer Creek Falls that then plunges 150 feet from the cliff face directly into the river. The same tree garden as seen from above in side Deer Creek Grand Canyon in the proceeding photo. Lava Falls Rapid is often thought to be caused by the lava field that flows from the Uinkaret volcanic field. But this is not factually accurate. 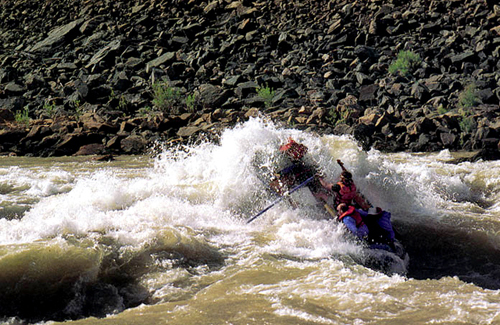 What causes the rapid is actually an out flow of huge boulders from Prospect Canyon into the the river, narrowing and constriction of the river channel, which increases the velocity of the current and added to the elevation drop which increases the turbulence and speed of the water to make on of the scariest run able rapids on earth. Anticipating the big drop Lava Falls Grand Canyon canyon. 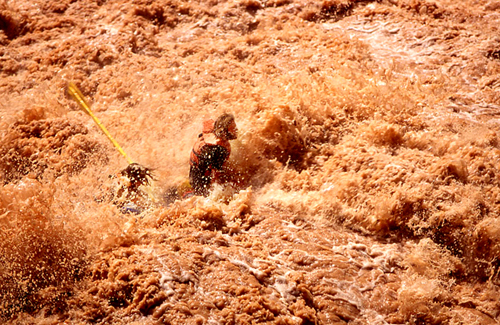 Two of the worlds leading canyoneers of the 1990′s, Jill Bielawski and Eric Manthey, challenges Big Lava. What a thrill to see, what a thill to do, what a thrill to photograph like this. WOW, one of life’s biggest thrills, in the boat and out! The Havasupai, an American Indian tribe is called Havsuw’ Baaja, blue water people, have lived in the Grand Canyon for at least 800 years. 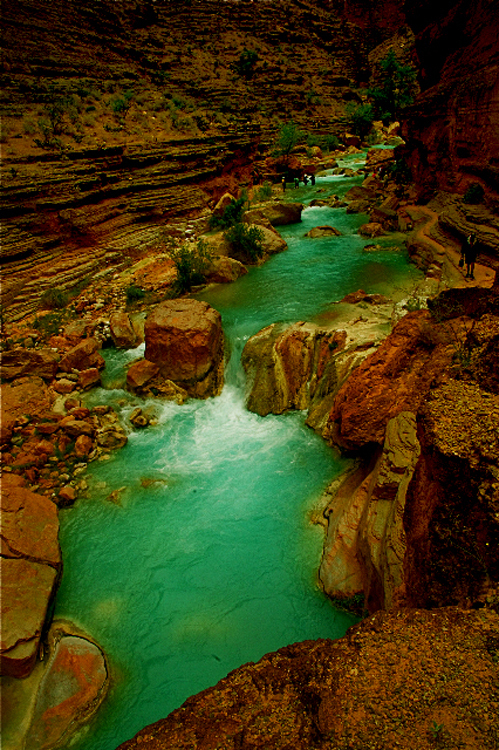 Havasu Creek and the little village of Supai is their homeland. The creek and it’s sky blue colored water is a major attraction for river runners. The creek stays about 70 ?F year round and the clear warm water often offers a welcome respite and swim from the cold muddy currents of the “Red” River. 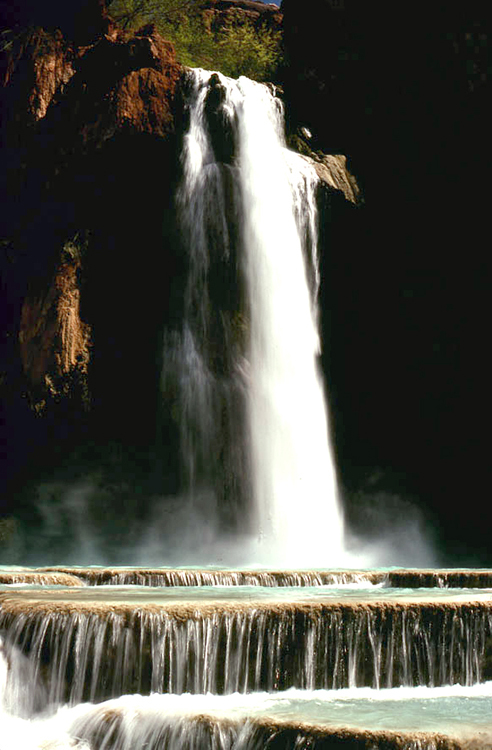 Havasu Falls is considered one of the most beautiful water falls in the world. It is ever changing as new terraces are built up by the lime in travertine sky blue waters and then washed away by the occasional flash floods. 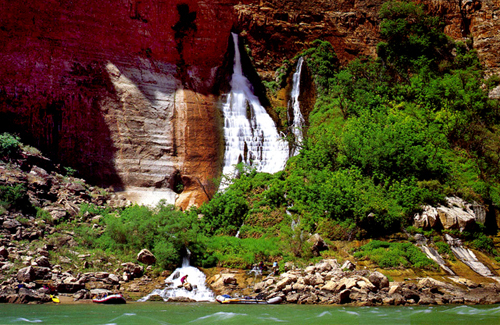 This falls is about 120 feet high making it one of the highest in the Grand Canyon. 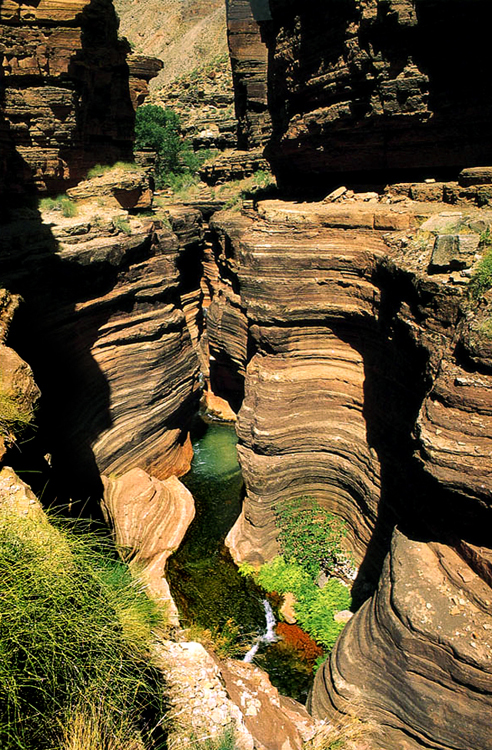 If you have never been there, it is a life time experience if one loves canyons, waterfalls and remote swimming pools set deep in red desert cliffs. If one comes down by mule from the rim or takes the longish hike up from the river it is forever worth it. No matter if you are a child or an adult come to our mystical Grand Canyon again and again and experience your gift of life again and again in this paradise hidden deep in the earth.